Taking proper care of your heart requires a lifestyle commitment that not everyone is willing to make. People of all ages can get caught up in bad habits like smoking, unhealthy eating, and lack of exercise. Proactively taking steps to prevent heart disease is essential to living a healthy life. Check out the tips below to get started on your journey to healthy living. Smoking remains the leading cause of preventable death and disease in the United States, killing more than 480,000 Americans each year. The act of smoking is always extremely harsh on our hearts and blood vessels by giving way to increased blood pressure and depleted oxygen levels. In just 20 minutes after that last drag, blood pressure levels and pulse rates begin dropping. After a full year of quitting, a person’s chance of a heart attack is diminished by half. Reducing the risks associated with cardiovascular disease begins with putting out that last cigarette, for good. Remember, quitting tobacco products completely is the only working strategy to fully protect your heart from the negative effects of smoking. increases in blood pressure and further complicate symptoms of an existing cardiovascular disease. Cut down on recipes that are high in cholesterol. Substitute plain fruits and vegetables into your shopping list for items that are high in sodium, like instant dinners. Consider purchasing from local producers to add an extra dash of freshness to your next entree. Looking for a new culinary direction for your meals? Check out the delicious, heart-healthy dishes that are common to the Mediterranean diet. Seniors can benefit positively from the food choices associated with a Mediterranean diet, as well as the cultural emphasis on enjoying meals with friends and family. One of the greatest challenges is pairing a nutritious diet with a regular schedule of exercise. Older adults, who are at the greatest risk of heart disease, must engage in regular physical activity to enjoy lower, safer blood pressure and cholesterol levels. If you are looking for activities to stay active, don’t underestimate the value of simply going for a walk if the weather is tolerable. Many adults with joint pain and arthritis will turn to yoga or water aerobics as their outlet for physical activity. Water provides a kind of low-impact resistance training capable of targeting your joints and muscles. 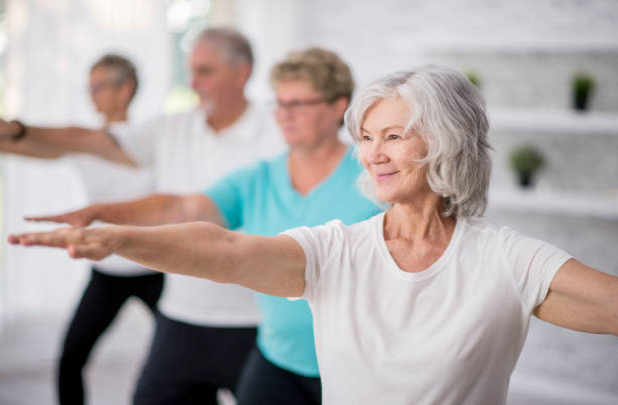 As always, family members and caregivers should work to improve mobility and fall prevention by finding exercises that target the skills and abilities that can keep seniors safe during their daily routines.